Apple - iLife - iMovie - New in iMovie ’08. This is a touch screen video editing program, end of story. Lawrie Mifflin -- Talk to the Newsroom -- The New York Times -- Reader Questions and Answers. Will Times Reader Include Video? Q. I have been using the Times Reader for a while now and like it as a great, alternate way to read something that feels more like the paper. Are there any plans to incorporate multimedia (audio or video) into the product? A. 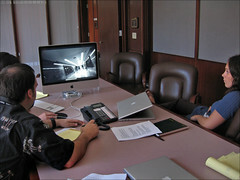 Yes, we do plan to offer video and multimedia. Because the files are so large, video will only be available to be played when the reader knows you are online. (It allows you to download articles and photos for reading offline). We hope to have this integrated by January. Many, many more great questions about multimedia at The New York Times. Open and insightful answers which help us get a handle on at least one media organization's attempts to swim in the online waters. The New Yorker: It Should Happen To You. The New Yorker tracks the YouTube phenom via the video posts of litlleloca. "The Oscar was delivered rather unceremoniously—not in March, at the Academy Awards, but in August, three and a half minutes into a sketch Ryan was filming, while she was still in character as Cynthia, an eighteen-year-old Latina from East L.A. who is better known as Little Loca, after the handle Ryan uses when she uploads some of her homemade sketches onto the video-sharing site YouTube. This was about the fortieth in a series of short Little Loca videos that had by then attracted over a million viewings, thanks to Loca’s “big old mouth” (both literally—her heavily outlined lips command attention—and figuratively) and her irreverent putdowns (“You better watch out, fool, because God’s gonna come around and strike you down with some lightning if you don’t be careful”). 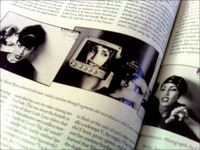 Loca was wearing a bandanna and hoop earrings, and sitting on a sofa, against a plain white wall, between two women who were known to regular viewers as Smiley (a friend of Ryan’s) and Silent Girl (Ryan’s cousin). Rap music was playing in the background." To see how life imitates art, check out 2003's William Gibson novel Pattern Recognition. Viral video as uber-marketing tool. Sound familiar? Evan at the Summit. - This is a Test! My nephew's 11th birthday party was at the Earth Trek Climbing Center in Columbia, MD. A very neat way to entertain; physical activity and no video games! Here's my son Evan reaching for the top of the adult wall! Published with one of the many new online video services. compressed in Quicktime and then uploaded to VideoEgg. This one is from a book party for Leslie Morgan Steiner's 'Mommy Wars'. and then uploaded to Google Video which offers code to paste the video into a web page.